CVS is ALWAYS having BOGO sales for Revlon products. 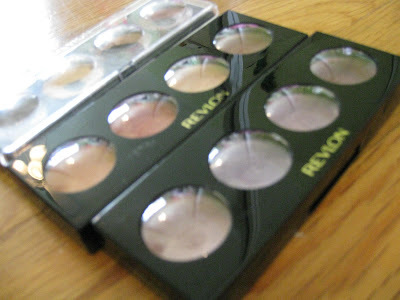 I actually picked up these Revlon Illuminance Creme Shadow Quads months ago but am finally getting around to posting a review. I already owned 1 of the quads (which I bought a year or 2 ago?) but since then, they've changed the formula. The packaging is alost slightly different. The old one was black with a clear cover while the new one has a black cover. The old one had the Revlon logo at the top with gold font on the back while the new one has the logo on the bottom with white font on the back. Not much of a difference. Anyways, I like the wide selection of colors (according to drugstore.com, there are 11 different quads.) The formula is alright. I would never ever use this as a creme shadow (even though that's what the product is supposed to be.) If you use them alone, or even over a base (UDPP, TFSI, MAC paint pots), they still crease. I have dry lids too but they just always seem to crease. I think these are great as a base -meaning over a primer but under your actual eyeshadow. They are great for enhancing an eyeshadow and making the color more vibrant. I use them like I would NYX Jumbo pencils -not as a primer but to make my eyeshadow even prettier and brighter. These are actually pretty sheer also so you'll need to add a few layers. As for the packaging, I hate it. There's a just a flimsy, plastic cover. The cover on my "Precious Metals" quad broke quickly so I'm trying to take extra care of the others. The lid tends to open very easily so be careful if you're going to throw this into a bag with all your other makeup (unless you like a mess or creamy glitter all over your things.) There is no mirror and the whole thing is just really cheap (I guess that's one of the reasons the price is so low.) The only good thing about the packaging is that it's pretty slim and is light weight. The value is good (you can pick these up at Walmart for like $4.95) or get them at drugstores for around $6.50 (wait for the coupons and you'll get two for the price of one.) Overall, I'd give these a C+ grade. These are great to have but not a necessity. Above picture was taken with FLASH. The colors are actually a tad more accurate without flash. This is the same palette but I took a picture with NO FLASH. I couldn't really capture the actual "richness" of the colors. It's basically somewhat inbetween the 2 pictures but they lean more towards to NON-flash pictures. Above Revlon Illuminance Creme Shadow Quad in "Khaki Suede." First color is pinkish/peach that barely shows up on my skin. It's very pretty but I have to layer it so many times just to get so-so coverage. Second (from left) is light green in the tray but almost white on my hand. It's very light that goes on as a beige-white with slight green tint. Third is a nice mink brown. This is my favorite. Not too much shimmer but nice sheen. Last is a gray/pewter. I don't really like this quad but it was the only other one left so I decided to try it. Here above is the quad in "Skinlights." The first color or the left reminds me of MAC Painterly Paint Pot but lighter and more peachy. This is an almost matte color with very little shimmer. The color second from left is a rosy coral with more red. This is a really pretty color with a gold sheen and shimmer. 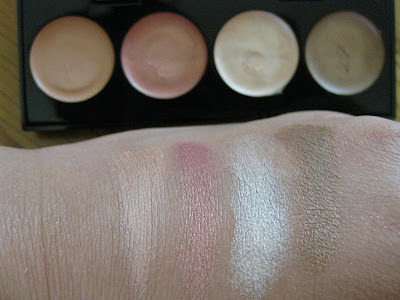 The third color is a very light champagne with a hint of gold that looks almost white on my skin. The color all the way to the right is a mocha brown with a light tint of red. Overall, this is an OK palette. I only like the rose gold corally color. Shown above is "Wild Orchids." Of all the quads, this is the one to get. The shade on the far left is a pink shade of purple. The shade second to the left is a blue violet. The next shade is a muted purple -almost like like the "dusty rose" of purple. The last shade all the way to the right is a plummy/red/brown. Here above is another Revlon Colorstay Ultimate Liquid Lipstick in "Perfect Peony." I don't like this color at all. It's just a medium pink that does nothing for my lips. It's almost the same color as my natural lips but it makes them look worse! My lips feel and look very dry (the lighter colors feel dryer than the darker shades.) I loved these "lipsticks" (I feel like they're more of a stain) at first but I've realized that they are really drying. That's it for now. 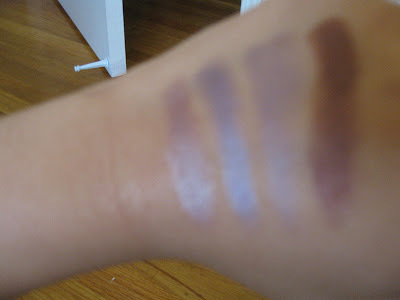 If you're looking into the Revlon Illuminance Creme Shadows, be sure to pick of "Wild Orchids" if you're into purples. I wouldn't recommend them as an eyeshadow but they make a good base (with primer underneath.) They're pretty cheap but be on the look out for BOGO sales for extra savings. I'm sure you've all seen the items that were in the box since it was released weeks ago but here's a picture of the items I received. Both boxes contained similar items although their were a few differences. We both received the "Totally Texty" shampoo (it smells good! 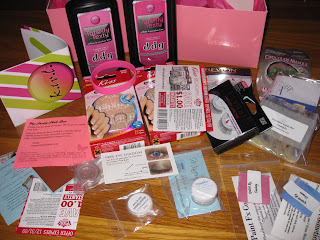 ), KISS French Nails in "Real Short," Revlon Fantasy Lengthes lashes in "Defining" and "Flirty", and mineral eye shadow samples from Paint Fx Cosmetics. The rest of the items varied between the boxes. There were also other mineral makeup samples, facial scrubs, face masks, and soap. 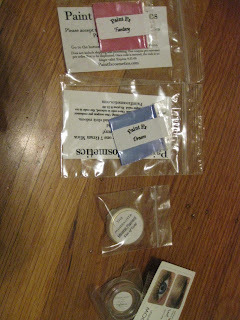 From both boxes, I received a total of 4 mineral makeup samples -3 eye shadows, 1 blush. 1. Paint Fx Cosmetics "Dream"
Kind of a light periwinkle shade. It reminds me of the sky (when it looks lavender and blue and pink) VERY pretty.. shifts to purple. It's not a very light or dark shadow.. just medium. Medium shimmer.. great color payoff. I want a full size version of this but I don't know if it goes with my skin though. 2. Paint Fx Cosmetics "Fantasy"
Beautiful Fuchsia, very basic color with medium shimmer. I don't have a need for this because I already own colors that are so similar to this but it's very pretty. 3. The Mineralista "Kiss of Gold"
It's a lighter shade of gold but very flashy. It's so shiny and bright with a fantastic "sparkling effect." It looks like a white/gold but most definitely gold. This is very metallic-y and contains lots of shimmer. 4. Orglamix mineral blush "Tarragon"
This is a dusty rose color with lots of shimmer. It looks too shimmery for my cheeks but I could use it as an eyeshadow. *I also received a coupon from Orglamix stating that the first 25 people who mention "My Pretty Pink Box" in their Orglamix order will receive a free full size eyeshadow. I went to go get one but they were already out! However, Cheri (who runs Orglamix) happily gave me a free eyeshadow anyways. I will review those in an upcoming post. 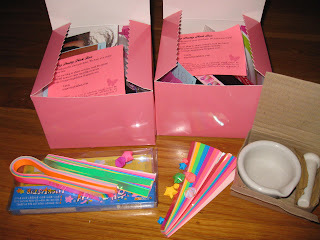 Also, the boxes included Paint Fx Cosmetic coupons for any full size eyeshadow for the price of......... 1 PENNY! 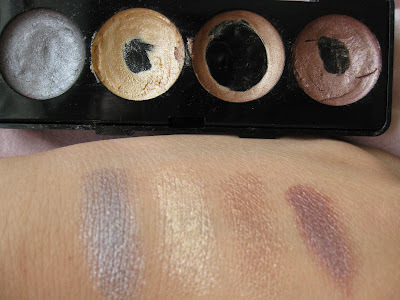 I will do a review on lots of Paint Fx mineral shadows soon. 1. Illamasqua Intense Lipgloss in "Fierce"
2. Illamasqua Sheer Lipgloss in "Rouse"
3. Illamasqua Intense Lipgloss in "Petulant"
4. Illamasqua Lipstick in "Fable"
5. Illamasqua Lipstick in "Tramp"
6. Illamasqua Lipstick in "Liv"
I thought nothing could rival my beloved Smashbox Lip Enhancing Glosses (http://www.smashbox.com/LIP-ENHANCING-GLOSS) let alone ever make me fall out of love with them. The formula for these Illamasqua glosses is moisturizing while the colors are rich and pigmented. They all appear on the lips as they do in the tube. 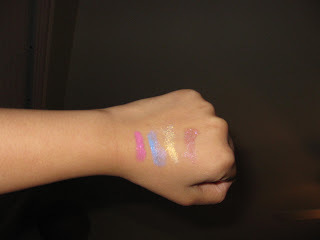 The swatches on Sephora's site were pretty much spot on so that was good. The lasting effect is pretty good and lasts a while (few hours) but it doesn't last all day like most glosses.It even smells nice.. kind of like vanilla and something else. I rated the value a "7" because it is so pricey. The tube only contains 7ml (0.2 Fl. oz) but then again my Smashbox tube says that there's 6ml for a dollar less. So why does the Smashbox tube look like there's more? Anyways, I just think these glosses should be a tad larger for nearly $20 a pop. The packaging is standard. I think it's a doe foot tube.. correct me if I'm wrong. Overall, I love these glosses. I've never had anything like them. Everything about them is amazing and I urge everyone to at least try one of these. Pictured above is Fierce. It's actually a little more purple than in the picture. I noticed on other peoples' lips it turned a very vibrant purple but on mine it was more of a vibrant pink/purple. I really love this stuff. If you're looking for a perfect purple gloss, one that isn't pink, plum, wine-colored, etc, get this one. Above is Petulant. This is my favorite of all 3 glosses that I purchased. The Sephora website describes this as a "hot magenta" and they are right on. The gloss looks so bright in the tube that it looks like it's almost going into "red" but it is a true magenta. I don't think I'll be wearing this much yet but I will in the Fall/Winter. I wear a lot of grays, blacks, and neutrals during the colder months so this will give everything a nice "pop." The formula is great when it comes to the darker colors. I thought the lighter colors would be just as phenomenal but sadly they're not. I like that these do not feel dry on my lips but as with most pale, matte lipsticks, the colors make your lips look so dry and gross. I thought that this would be "the One" but sadly, it wasn't. I thought hat I could actually wear pale lipstick without having cracks on my lips -but I was wrong. These did not meet my expectations. The darker color I purchased, "Tramp," is amazing. It's the best I've ever tried because of the rich color and non-drying texture. It goes on so smoothly and easily and the end results are great.. I wish I could say the same about the lighter shades. The packaging is OK and very average but it's prone to finerprints.. which I can't stand! ! ! Here is Fable with clear gloss over it. Again, you can't really see the cracks but in person, you can definately see them. I guess they're not too noticeable but if you're up close and personal, you can tell. I can't stand the look of "cracked lips" so I feel like not even wearing this lipstick (with or without the help of some clear gloss) was better in general. Love the color, hate the dryness. Pictured above is Liv. I'm so in love with this color. It's a pale, milky lavender that I've never seen in any other lipstick before. You can see all the cracks better in this picture. It was just so drying. It doesn't necessarily feel dry but it looks dry and I rather have it the other way around! =( Maybe this would work on a person with ultra smooth/soft lips but that person is not me. Pictured above is Tramp. This is the reason I gave the lipstick a high overall (8.5) score. I didn't even fill in my lips all the way (oops.) Sephora describes this as a "matte true red" but I noticed a sort of sheen (as you can see in the picture.) It's mainly matte but there is a slight sheen which is nice. This goes on so effortlessly and looks beautiful. I love the formula for the darker colors and I hope they improve the lighter colors in the future. Above is Rouse. This is a basic pale pink/almost clear gloss but it's better than all the others I own. Sephora describes it as "vibrant bubblegum pink" but it's not very vibrant and pretty much almost clear but you do see hints of pink. I love the formula and the nice sheen though (I don't see any shimmer.) This is a very basic gloss and easily dupable but I think this formula's the best. It feels and looks nice but it's not a must-have. The Illamasqua lipsticks are $20 each and the glosses are $19. Check Sephora for more swatches as they are pretty accurate. I would love to try Illamasqua's blushes and eyeliners next. Have you tried any Illamasqua products? How'd you like them? *Note (March 27, 2010): I've re-read this post and wanted to update on how I feel about these products. I've since returned both lipsticks -they started to feel drying. They are definitely not the dry for a matte lipstick (pretty much the oppostite) but for a lipstick in general, they are. I don't like dry lip products whatsover because I have dry lips to begin with. I would still recommend them for their high pigmentation and overall good formula though. I've updated the lipstick rating to an 8/10 -just .5 less than my original rating. (I don't use this rating system anymore though.) 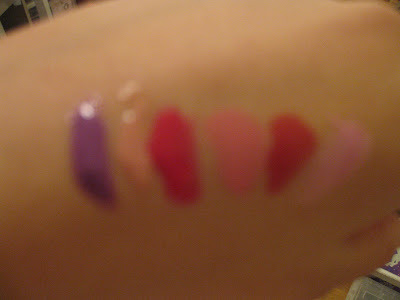 I still like the glosses although I just don't use them muct. Petulant is a bit bright for me and Rouse wasn't so special (I ended up passing this one on.) Rouse is nice for a basic gloss though -the formula is great! However, I don't really like clear/sheer glosses much.